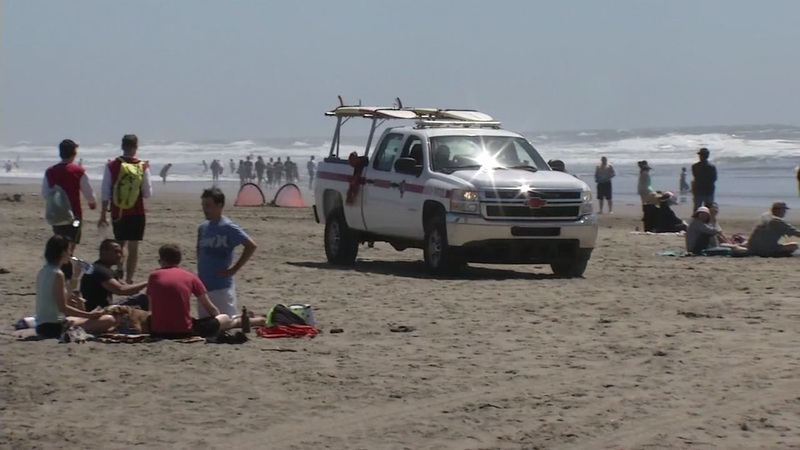 SAN FRANCISCO (KGO) -- Lifeguards rescued a 13-year-old girl that was caught in a rip wave at San Francisco's Ocean Beach Sunday morning. It happened around 11:50 a.m. at Pacheco and Great Highway. Lifeguards told ABC7 News the girl got separated from her board and was caught in a nasty rip. They said during the spring season the rip currents are active and defined. There are two trucks with four lifeguards working at the beach this weekend. "We figured that when the sun is out, it's time to go," San Francisco resident Dominic Wong said. "You got to be a little careful and aware of the rip currents and stuff like that," Kihlon Trangolden said. Temperatures are expected to rise especially mid-week. "There's a high chance I'm going to be sick on Wednesday I think," Wong said. The National Weather Service said there will be a moderate risk for those sensitive to heat near Los Altos and Hayward on Wednesday. On Sunday, it was hot in Los Altos, with several people seeking shade to keep cool. In Oakland, a crowd gathered at an event hosted by Daybreaker along Lake Merritt to enjoy the warm weather, music, dancing and ice cream. Click here for full coverage on Bay Area weather.